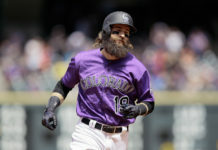 The Colorado Rockies may have found a spark during Wednesday afternoon’s matinee against National League West rival San Diego. The ejection of All-Star third basemen Nolan Arenado helped jumpstart the Rockies in a 6-4 victory to wrap up their first homestand of 2018 on a winning note. Tensions were high entering the ballgame after the Padres announced that outfielder Manuel Margot had been placed on the 10-day disabled list due to bruising in his ribs, which stems from a hit-by-pitch from Colorado pitcher Scott Oberg in the ninth inning of San Diego’s 5-2 victory Tuesday night. The thought of retaliation was discussed amongst media members at Coors Field ahead of the ballgame, with the expectation being that the Rockies were prepared should something develop throughout the game. The Rockies utilized another non-traditional lineup Wednesday, which included DJ LeMahieu hitting leadoff, Gerardo Parra batting second, and both Ryan McMahon and Mike Tauchman getting starts. Charlie Blackmon missed his second consecutive game with a quadriceps injury. LeMahieu and Para both reached base in the opening inning for the Rockies, and Trevor Story was hit by a pitch to give Colorado bases-loaded opportunity to open the ballgame, which they failed to capitalize on. After a clean second inning and top half of the third inning, Arenado led off the bottom half of the third for the Rockies only to be greeted by a 96-mph pitch from Padres starter Luis Perdomo that nearly hit him. The pitch, which appeared to be intentional, prompted Arenado to slam his helmet down and storm the mound. Perdomo threw his glove at a charging Arenado and a benches-clearing brawl ensued. The fracas resulted in a stoppage of play and five ejections. 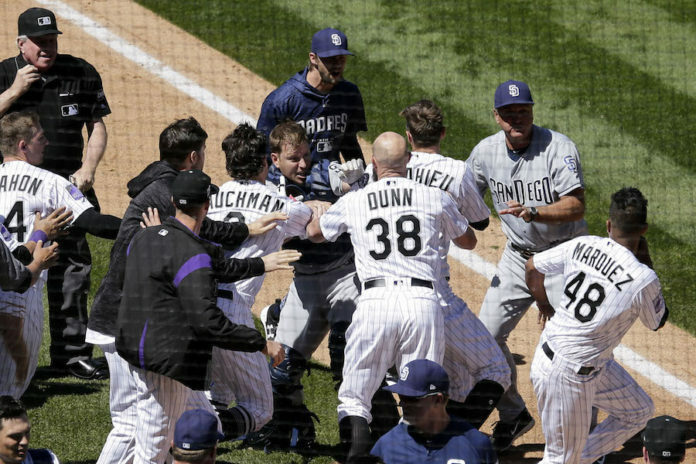 Arenado, starting pitcher German Marquez, and Parra were all ejected for their role in the brawl. Perdomo and Padres catcher A.J. Ellis were also tossed for their involvement in the incident. Suspensions could be on the horizon considering the obscene and disruptive nature of what transpired. Although the fight was ugly, it helped propel the Rockies to a much-needed victory. Following the ejections, the Rockies went on to plate five runs on three hits in the inning. Ian Desmond, who pinch hit for Arenado once he was ejected, reached base after a throwing error by third baseman Cory Spangenberg. From there, Desmond stole second and scored on an RBI single from Carlos Gonzalez. After walks to Story and McMahon and a sacrifice from Tauchman, the bases were loaded for Tony Wolters. The catcher hit a single to center, scoring three runs aided in part to an error from center fielder Franchy Cordero. Pat Valiaka followed with an RBI single to score Wolters and put the Rockies ahead 5-0. The fourth and fifth innings were clean for both sides, but the Padres got on the board in the sixth when Cordero hit a solo home run to lead off the inning. After that, Hosmer and Pirela both reached base with Hosmer scoring on a fielder’s choice and Pirela following him on a passed ball to cut the Rockies’ lead to 5-3. 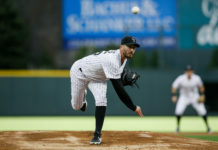 The Rockies got a run back in the sixth inning on a sacrifice fly by Desmond to score LeMahieu who led off the inning with a double and advanced to third base on a sacrifice bunt from pitcher Antonio Senzatela. 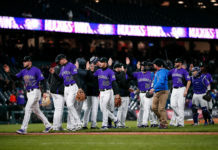 Eric Hosmer hit a home run in the eighth inning to make the score 6-4, but the Rockies bullpen was able to lock things down after that, which included a clean ninth inning from Wade Davis to solidify the victory and earn Davis his fifth save in six tries. Marquez was sharp on the mound prior to his ejection as he logged three innings, allowing just one hit while striking out four batters. Senzatela (1-1, 9.39) did a solid job filling in for Marquezrquez as he went three innings, allowing four hits and two runs to earn the win. Adam Ottavino also had a nice outing which included a pair of strikeouts in his lone inning of work. NEXT UP: The Rockies travel to Washington D.C. to take on the Nationals in a four-game set starting Thursday night. Chad Bettis (1-0, 2.53) will square off against Gio Gonzalez (1-0, 1.59) with first pitch set for 5:05 p.m. MDT.